Bangkok: Convenience chains are the main threat. Politicians, authorities and many small Thai retailers are missing the point by claiming that hypermarket chains are driving traditional family stores into extinction, according to marketing and distribution experts. They argue that mushrooming convenience store chains such as 7-Eleven, Family Mart and AM-PM are the most direct rivals to the existing small-scale local retailers and to Allied Retail Trade (ART) a new state-backed venture. Distribution guru David Edwards of Logistics Bureau Asia said yesterday that he, along with many marketing experts, was puzzled why so little had been said about the proliferation of chain convenience stores, which had been driving traditional grocery stores out of business. There are now 2,002 7-Eleven stores in operation in Thailand. 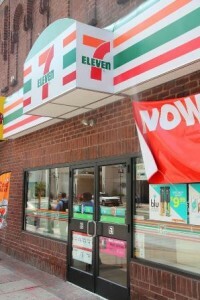 CP Seven Eleven Plc, the local franchisee, continues to expand rapidly. It recently sealed a partnership agreement with PTT Plc, the partially privatised oil company, that would result in another 1,000 7-Eleven stores coming into existence at PTT petrol stations over the next two years. Family Mart, the Japanese convenience store chain, is sparing no effort to boost its retail network in Thailand, seeking to be the second largest operator in the sector Thailand. Current efforts by authorities, spearheaded by Deputy Commerce Minister Newin Chidchob, to pass a new Retail Act zero in on hypermarket chains such as Tesco Lotus, Carrefour and Big C.
Hypermarket chains are also speeding up the opening of new sites ahead of legal restrictions. Tesco Lotus, majority-owned by the British supermarket chain Tesco, has just opened its 37th store in the Thanyaburi district of Pathum Thani. Convenience stores were open about their strategies to double store outlets in the coming years, specifically targeting upcountry areas, said Allan Cambridge, a retail distribution expert with Logistics Bureau Asia. To counter this threat, the government aims to convert qualifying stores into ART branded outlets, effectively creating a new level of competition in the lower retail trade. More than 2,000 ART-franchised stores are planned to open nationwide in the next three years, according to Anuchai Werapatanakul, managing director of ART, a non-profit private organisation with state funding. ART needed to be careful that non-qualifying family shops were not hurt by the opening of ART stores nearby, otherwise the initiative would have turned on itself, said Mr Cambridge. ART said it aimed to offer lower prices than 7-Eleven stores. However, the ART initiative was created to help small-scale retailers remain competitive against increasingly sophisticated competition. Mr Edwards warned that the success of ART would depend on the successful combination of distribution management and daily operations. He said ART’s success would come from creating improvements in two main areas: streamlining the flow of both data and products, and the standardisation of daily operations. Streamlining the supply chain and reducing purchase prices would help the small-scale retailer make more money, he said. But it would not necessarily allow such retailers to compete head-to-head with the powerful and well established operators that enjoyed the benefits of fully centralised distribution systems, he noted. By centralising distribution, manufacturers and wholesalers deliver to a central warehouse in one large vehicle. Orders for the small-scale retailer are processed on a daily basis and delivered to each store, to a pre-determined delivery schedule. Inventory levels in stores can be reduced because they can now receive products daily, rather than having to store products for weeks and months before delivery to manufacturers.